You have probably been told by your doctor and virtually everyone else that you need to wear sunscreen on a daily basis. While this can be a bit annoying, research has determined just how important this habit really is. For instance, did you know that the rates for both non-melanoma and melanoma skin cancer have been rising over the last few years? As there is an increasing depletion of the ozone layer, people are being exposed to a greater amount of UV rays than ever. To make things even scarier, it looks like this trend will not be stopping anytime soon. Scientists predict that many countries would continue to experience an increase in the number of skin cancer cases reported. Now, as you are probably aware, the only real way to protect yourself is to wear sunscreen on a regular basis. 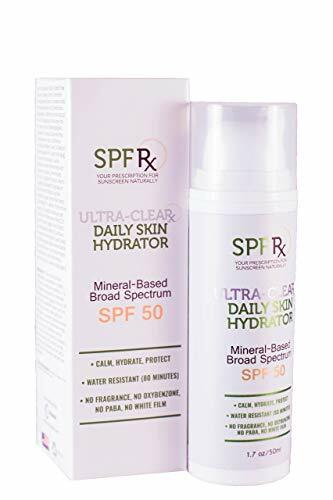 As someone who suffers from dry skin, though, you know just how difficult it can be to find a sunscreen that is compatible with your skin type. To make this a simpler process for you, here you will find tips for finding the perfect sunscreen and even some options to consider. 1.2 What Type Of Sunscreen is Better for People with Dry Skin? For brevity, here is a quick summary of the sunscreens we’ve reviewed below. Before going ahead and choosing a sunscreen, you need to first understand the types that are available on the market. The two terms that you are probably going to hear quite a lot during your search is ‘mineral’ and ‘chemical’ sunscreens. While mineral can sound rather technical what it is actually referring to is a physical barrier against UV rays. In these sun creams, you will find that the main ingredient is either zinc oxide or titanium oxide. It is probably the type of sun cream that you have been using since you were a child. It is most typically identified by the thick white layer that it leaves on the skin. Now, scientists have been able to prove that using a mineral sunscreen can actually decrease the chances of skin mutations and thus, skin cancer. So, by using a mineral sunscreen, you are effectively reducing your chances of having skin damage. Of course, few people actually want to walk around with a white mask on their face and body which is why modern sunscreens have been using nano zinc oxide or titanium oxide. This allows the cream to be sheer on your skin while still affording you protection. For a while now, there has been a fair amount of debate regarding just how safe this type of mineral sunscreen is. This is because people feared that the smaller sized particles would be more readily absorbed in the lower levels of the skin, causing problems. Fortunately, there has been a considerable amount of research conducted and it has been determined that it is quite safe for you to use. Then, there are chemical sunscreens – these differ because they contain substances like oxybenzone, retinyl palmitate, and avobenzone. This type of sunscreen is actually fairly common and you can find it at any drugstore. Unlike the physical sunscreens, these are absorbed into your skin. Here, it attracts the sun rays so that you can be spared. There has actually been a lot of concern regarding chemical sunscreens. This is because experts have been able to find trace amounts of these substances in your skin and body. Not to mention, people were also under the impression that these ingredients were responsible for hormonal imbalances and fluctuations. This has led to the belief that it is dangerous. Well, the good news is that it isn’t so – these ingredients have been proven to be safe for you to use by numerous professionals. What Type Of Sunscreen is Better for People with Dry Skin? Now, the question that needs to be answered is which of these sunscreens is better than the other? Also, is there one type that works more effectively for people with dry skin? The answer to both these queries would be: no. there isn’t one type that is superior to the other. Rather, it is about choosing a formula that works best for you. For instance, if you tend to have sensitive skin that is easily irritated, then you may find that mineral sunscreens work best. If mineral sunscreens don’t appear to agree with your skin, then it is time to try a chemical sun cream. Yes, one of the first things that you should focus on with any sunscreen is the sun protection factor. If you have fair skin that burns quite easily or you spend a lot of time outdoors, you will need one that has a factor of 50+. If you have a light to medium skin tone or spend a moderate amount of time in the sun, look for an SPF 30 sun cream. Now, most people mistakenly believe that if you have dark skin, you don’t need sunscreen. Well, you do but you can get away with using a lower SPF. So a cream with an SPF of 15 may be adequate. After the SPF, there is no denying that the moisture factor is most important for dry skin. Now, you should be aware that while most sun creams may appear to be greasy, they don’t actually contain the moisturizing features that you require. The reason you need moisturizing agents is that it helps to improve the protective layer of your skin, making it easier for your skin to retain moisture. This, in turn, can help to greatly relieve your dry skin. Now, the exact ingredient used changes drastically from one product to another. However, typically those with oils, emollients, and water-based ingredients are a good option. The last thing that you need for is your skin to be irritated or suffer from an allergic reaction. This is especially true for the skin on your face. To avoid having to deal with such issues, you should stay away from ingredients such as parabens, fragrances, and alcohol. On a final note, you should remember that it is important to slather on the sunscreen every time that you leave the house. You will also need to wear sunscreen during the winter as the sun can be just as harsh on your skin. 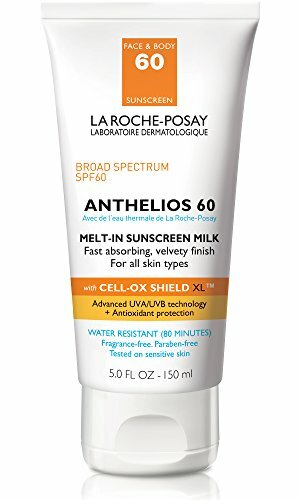 What makes this La Roche-Posay sunscreen one of the best products for sunscreen? Well, because it lends a velvety feel to your skin, thanks to all of the moisturizers contained in it. 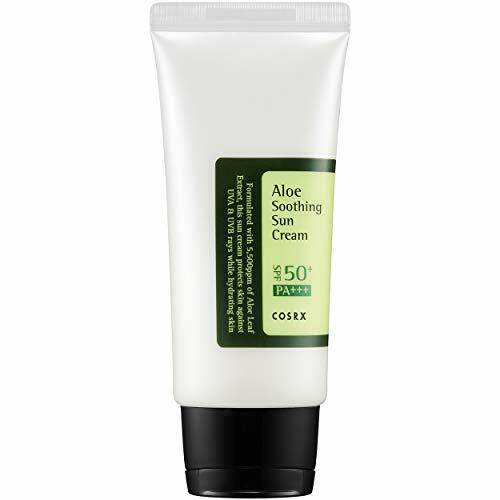 With this cream, you will be able to enjoy soft and supple skin and not have to worry about it drying out. At the same time, because it is absorbed by the skin so quickly, you don’t have to deal with an overly oily glaze. This sunscreen can be used on your face and body so you don’t really end other sun protection products with you. It should be noted, however, that this sunscreen may not be suitable for people with incredibly sensitive skin. If you tend to burn easily, you are going to enjoy the fact that this cream boasts an SPF of 60, making it ideal for anyone with very fair skin. It is also a good choice if you spend a great deal of time outdoors. The sunscreen offers up advanced protection, even managing to fight free radicals which can cause signs of aging to appear. To top things off, the cream is water-resistant for up to 80 minutes, making it perfect for the summer. The key ingredient to pay attention to in this sunscreen is sodium hyaluronate – This is because it is able to contain a considerable amount of moisture. This is what helps to keep your skin hydrated as long as you are wearing this sunscreen. Of course, this isn’t all that the sunscreen is capable of. It uses zinc oxide to provide you with broad-spectrum protection while various other components work as a backup to deflect the sun’s rays even more. Thanks to all of these ingredients, you can rest easy knowing that your skin is well protected. 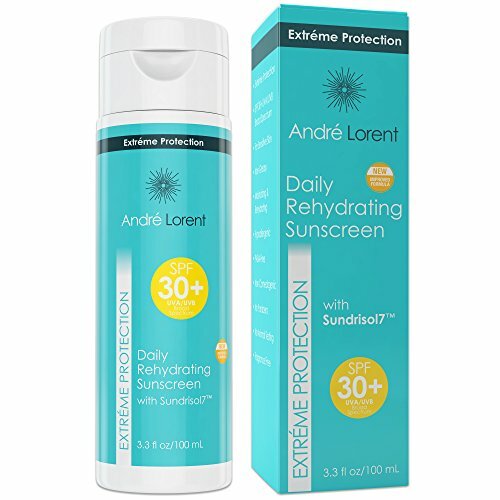 This is an SPF 30 sunscreen which makes it good for most situations but may not be suitable for very hot climates or for extended periods of time. It is also not water-resistant so you will need to keep reapplying it, especially if you start sweating. Apart from these small setbacks, though, this sunscreen is a topnotch product, particularly if you are looking for a cream that is able to prevent signs of premature aging on your face. It also works quite well on delicate skin as it doesn’t contain any fragrances or dyes. Since you are supposed to use sun protection every day, you are often in need of a cream that can do everything for you. Well, the SPF Rx lotion is definitely the product that does this. The lotion is ultra-moisturizing which makes it perfect for incredibly dry skin. It contains hyaluronic acid which is able to draw moisture into your skin and retain it. It forms a protective barrier to ensure that your skin will continue to be soft and hydrated throughout the day. So, just how well does this lotion hold up against the sun? Well, it does incredibly well actually, with a sun protection factor of 50+! On top of this, it also contains ingredients that protect you from the rays that are emitted by electronic devices, preventing signs of early aging from appearing on your skin. What’s more, it is incredibly water-resistant, managing to last for up to 80 minutes in the water. Since it is a mineral-based sunscreen lotion, it will be a good fit for anyone who has sensitive skin. The only real downside is that you need quite a bit of product to be able to cover your face. So, you may find the bottle coming to an end quite soon. What makes the COSRX sun cream stand out is the presence of aloe vera. What this ingredient does is improve the state and thickness of your skin barrier. In doing so, your skin is able to retain moisture more effectively, preventing it from drying out. So, the longer that you continue to use this cream, the better your skin will end up. Fortunately, this is an incredibly lightweight formula which is why it is absorbed into the skin so quickly. As a result, there is no weird mask left on your face by the product. Also, you get to ensure that your skin is treated much more quickly. Now, the other benefit regarding this sunscreen is that it offers you a high level of protection – SPF 50. So, those with fair skin will find that it offers more than enough protection. If you are outdoors, though, you should continue to reapply it continuously for maximum effect. Now, this sunscreen isn’t water resistant so if you are planning on heading to the beach, you are going to need something else. It may also not work well on sensitive skin as it is highly fragranced which can lead to an allergic reaction. You will be hard-pressed to find a sunscreen that is more moisturizing than this. After all, it is an actual sunscreen oil that is sprayed onto your skin. Due to this, it contains all the emollients that you need to keep your skin hydrated for longer. At the same time, this oil prevents moisture loss. So, once your skin has absorbed the hydration that it requires, you don’t have to worry about it evaporating from your skin. Of course, when you think of oil, the first thing that comes to mind is the word greasy. However, since the oil is evenly sprayed across your skin, it is readily absorbed. Although it may be providing you with all the protection that you need, you will not see it. Speaking of protection, you will be more than happy to learn that this sunscreen boasts an SPF of 50, making it suitable to virtually all weather conditions. So, regardless of your skin tone or where you live, you can ensure that your skin will remain in good condition. The only issue with this oil is that it is a chemical sunscreen. So, if you have a tendency to develop allergic reactions to skincare products, you may have a similar experience with this oil. What’s great about this sunscreen is that it has a texture incredibly similar to that of moisturizer. This is just one of the reasons that it makes it so effective for dry skin. The thickness works well to prevent moisture from leaving dry skin while also ensuring that you are well covered. In fact, this sunscreen works so well as a moisturizer that you will be able to use it on a daily basis, knowing that your skin will feel absolutely amazing. Now, this sunscreen contains all the ingredients necessary to protect your skin from the harmful damage of the sun’s rays. It ensures that you will not burn and that you are not exposed to any rays that can cause premature aging signs. If that wasn’t enough, it is also full of other nourishing ingredients that are all present to keep your skin in excellent condition. So, you get to enjoy protection as well as an improved skin tone. These are all the sunscreens that you can use if you suffer from dry skin and need several forms of protection.